In the third article of this series we defined the names that we would add on the Public Certificate, however we still need to configure Exchange and its web services to use those names, and by doing that we ensure that all communication between end-users and Exchange service will be using those names. 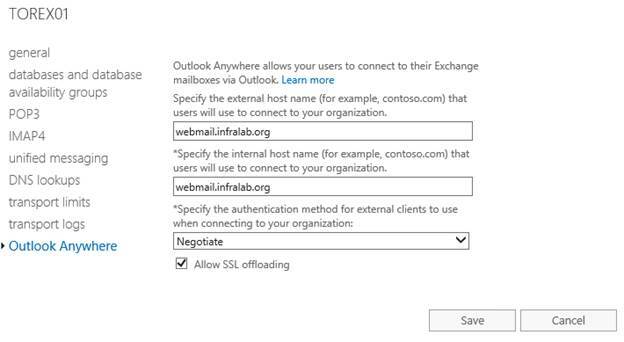 Webmail.infralab.org : will be used for ActiveSync, Outlook Anywhere and Outlook Web Access for external clients. 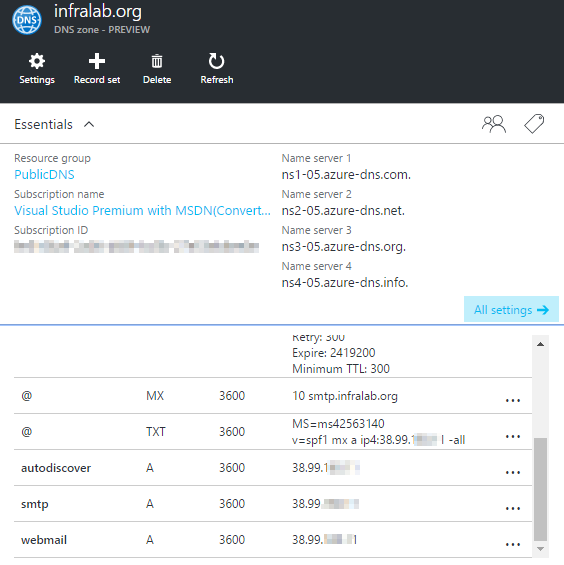 In the new page, add the servers and configure the external name which is webmail.infralab.org, and click on save and then close, as shown in Figure 01. 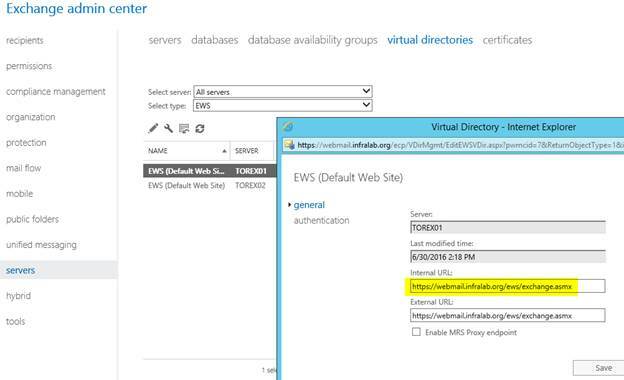 For each server of the site configure the Internal URL to be the same as External URL for the following virtual directories (EWA, OWA, ECP, Microsoft-Server-ActiveSync, and OAB), as shown in Figure 02. We will use the same name (webmail.infralab.org) for internal and external users as shown in Figure 03. In order to receive e-mail from the Internet and allow end-users to connect to the Exchange Services through webmail, Outlook Anywhere and ActiveSync devices, the external DNS must be configured. 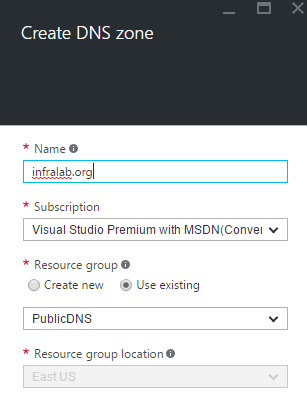 In this article series we will be using the power of Microsoft Azure to host our Public DNS. The first step is to sign up at Microsoft Azure, and it can be easily done using https://azure.microsoft.com portal. 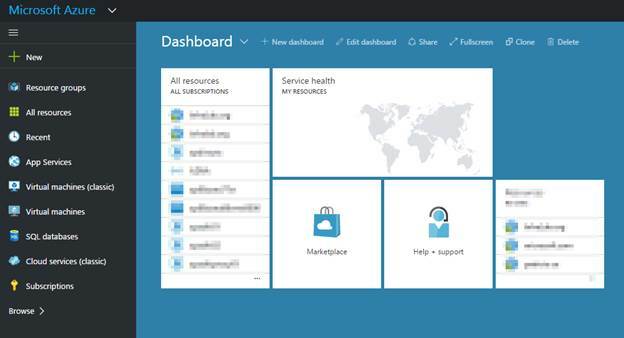 After creating your account, the initial page of the Microsoft Azure portal will be similar to Figure 04. In order to create a Public DNS, we will be creating a Resource Groups, click on Resource Groups item on the left side, and on the new blade click on Add. A new blade will be displayed (Figure 05), define the name of the Resource Group, subscription and location, and then click on create. After creating the Resource Group, click on it, and then Add a new blade with a search field will be displayed, type in dns and hit enter. In the results, click on DNS (preview), a new blade containing the description of the service will show up (make sure that the publisher is Microsoft), click on Create. 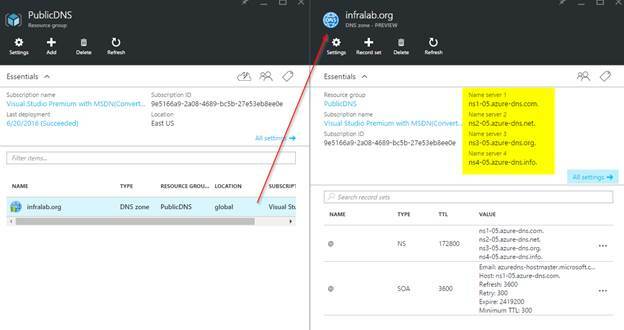 In the new blade (Figure 06), type in the DNS Zone name, in our series we will use infralab.org, select the subscription, and select Use existing for Resource Group and define the Resource Group that we have just created in the previous step. The new zone created in Microsoft Azure is not available on the Internet at this point. We need to open the Resource Group (in our series is PublicDNS) and a list of all zones will be shown (Figure 07). Click on the zone (infralab.org) and copy the Name Servers located on the right side (if you hover the mouse over, there is a copy button). 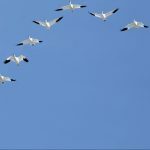 Until now all the changes performed in Microsoft Azure were local and it was not impacting the actual public domain. 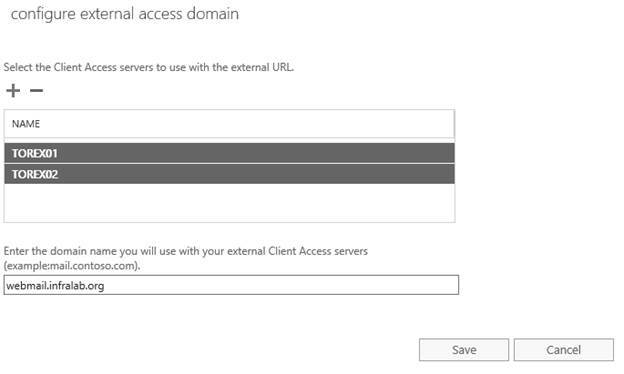 In order to switch over from the current Public DNS to Microsoft Azure, the Nameservers on the Internet Registrar must be configured to use the ones provided by Microsoft Azure. We are using a common Internet Registrar for this series (Figure 08), and we will be editing the infralab.org zone on their web interface. We are configuring custom nameservers to our domain (infralab.org). Keep in mind that after this change all the information that is configured/defined in Microsoft Azure DNS will be live. It is highly recommended to make sure that all entries are created in Microsoft Azure before switching over. The final result on the Microsoft Azure DNS should be similar to Figure 09. 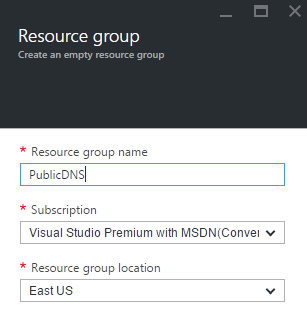 In this article, we covered the required steps to build the Public DNS in Microsoft Azure and the required DNS entries to match the already planned names that Exchange Services are using. In order to make the consistency, we also configured Exchange Server(s) to use the same names to support Exchange Web Services and Outlook Anywhere.